Last month the Startup Games team joined our presenting partner Tito’s Handmade Vodka in Key West, Florida for one of our most unique events yet -- Giving Spirit Day fueled by Love, Tito’s. We were joined by 49 of Tito’s top-performing, New Jersey based distributors for a morning filled with charitable fun and games in support of a South Florida charity, Make the Homeless Smile. Participants broke up into 4 teams that competed in the The Bag and Bust Relay Challenge -- a dodgeball and kit-building tournament for charity. As part of the game, each team was tasked with building the most kits for the homeless while protecting their homebase (a tower of canned food items) from being knocked down by dodgeballs. 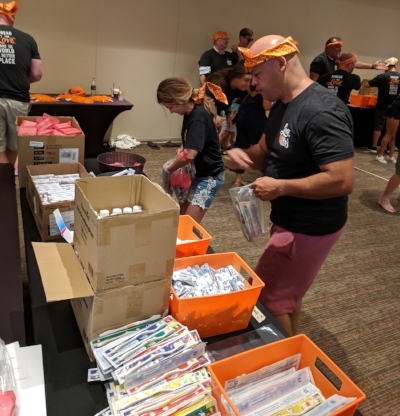 The Giving Spirit Day at Key West benefitting Make the Homeless Smile created a total of 531 kits for southern Florida’s female and family homeless population. The personal items included in the kits are helping to provide the homeless community with healthier lives and dignity. Amy Lukken, Chief Joyologist at Tito’s Handmade Vodka, closed the morning with a surprise $5,000 donation to Make the Homeless Smile. Not to mention, the winning team received a special crown ceremony, poolside bottle service and bragging rights throughout the rest of the trip. The strong partnership between Startup Games and Tito’s Handmade Vodka has allowed both organizations to scale their impact. Because of Tito’s help and support, Startup Games has grown the lifetime impact of our organization - donating over $550,000 to local charities while engaging over 46,000 people in purposeful team building activities across 200+ startups in Austin, Atlanta and Denver. Thank you to Tito’s Handmade Vodka for hosting Startup Games for a unique give back event engaging your distributors while helping to serve the local community! Startup Games is a high energy event engaging companies in tournament-style games for charity. We support team and culture building though philanthropy. Get involved in Startup Games 2019 season today! Announcing the Startup Games Austin & Level Up Games 2019 Teams!